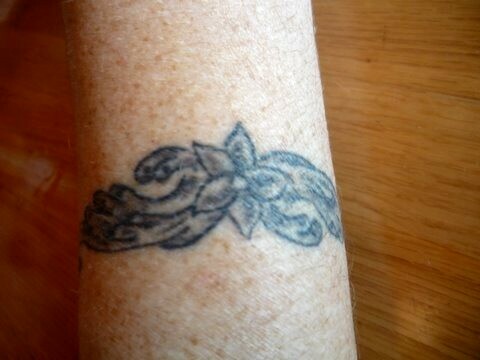 Virginia is a long-time reader and fan of Tattoosday who I have met on anumber of occasions. This is the first piece she has shared with us. This floral tattoo is at the top of her right shoulder and was done by Craig Rodriguez at Hand of Glory in Brooklyn. She explains further, "We are all hoping for an early spring. 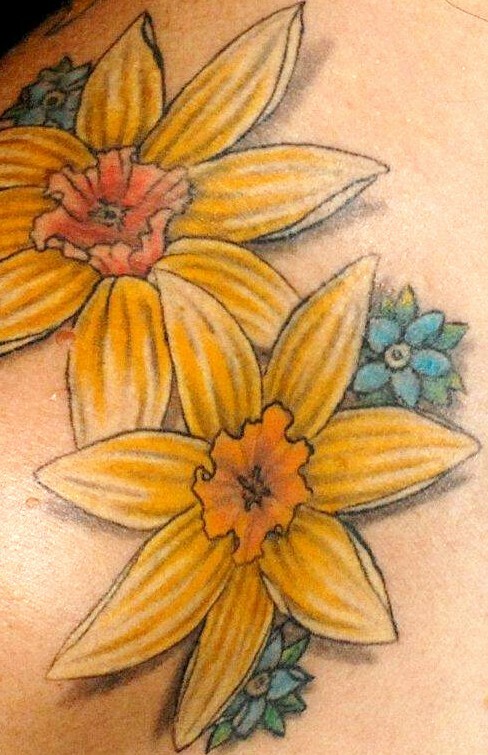 Daffodils and forget-me-nots. It is a memorial tattoo. I always bring yellow flowers to the cemetery when I honor my family members." 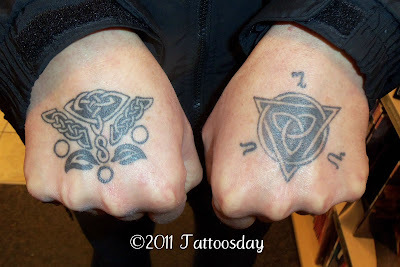 Work from Hand of Glory has appeared previously here on Tattoosday. A piece of Craig's was featured here. Amen to the early spring! 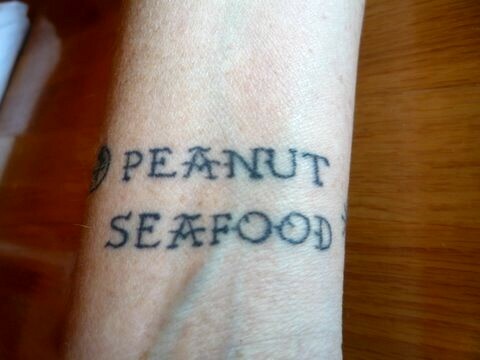 Thanks to Virginia for sharing this lovely tattoo with us here on Tattoosday! I met Mark in Penn Station on Friday, as I was passing through the New Jersey Transit waiting area. It was a rainy, unseasonably warm day, so I spotted his tattoos easily, as he sat in a short sleeve shirt waiting for his train. 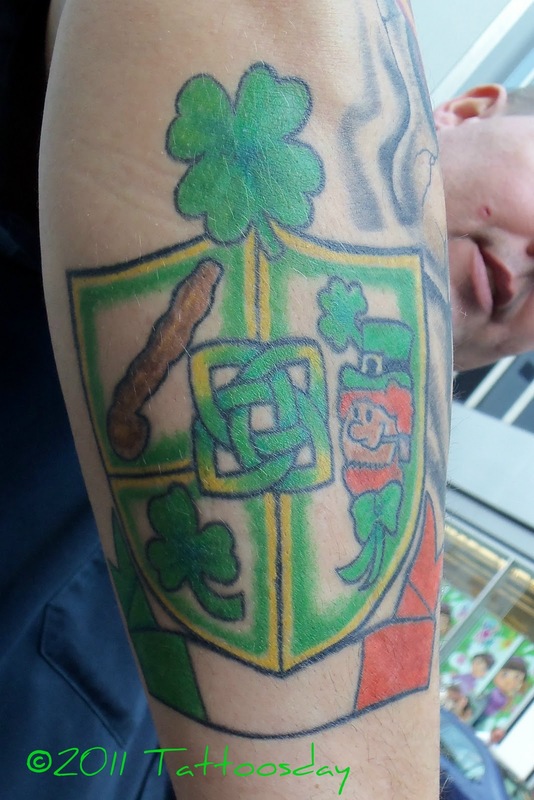 There's a lot going on here, in this tattoo which was completed in two sittings. In essence, this is a religious tattoo, which Mark considers an expression of his Christian faith. 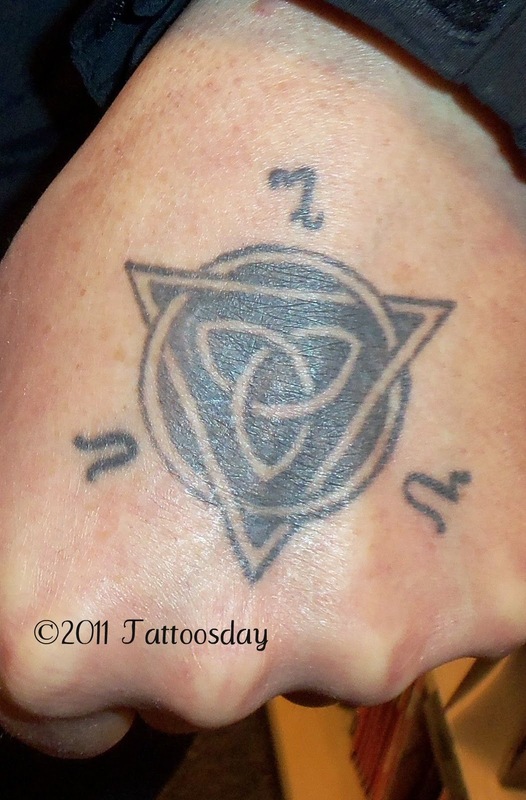 The base of the tattoo may look familiar, as it resembles the caduceus, which is now a symbol of the medical profession. However, Mark explained that this symbol was originally attributed to the cult of Mithraism that existed in Rome in the first to fourth centuries, before the city became the center of Christianity. The caduceus was originally attributed to the Roman god Mercury, and the symbol also important to the god Mithras. The Vatican in Rome is built over the remnants of Mithraism and Mark bears this symbol that represents that which Christianity replaced. At the base of the tattoo are the letters "XIVI". This is the Roman numeral for "17". Again, there is more to this than meets the eye. Many may think that the number 17 in Roman numerals is written differently, as XVII. However, Mark explained that this reversal of letters is intentional. According to wikipedia, "In Italian culture, the number 17 is considered unlucky. 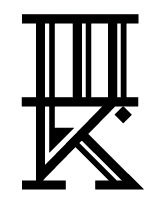 When viewed as the Roman numeral, XVII, it is then changed anagramatically to VIXI, which in the Latin language it translates to "I have lived", the perfect implying "My life is over." (c.f. "Vixerunt", Cicero's famous announcement of an execution.)". It is this "I have lived" phrase that resonates most with Mark, who told me that the "XIVI" number is often seen on gravestones. And finally, the word "SINNER," which runs vertically down the caduceus, is the belief that "we are all sinners". Again, this ties in deeply to Mark's faith. 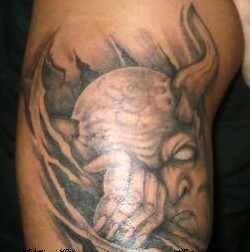 The piece was tattooed by Matt Pope at Another Tat2 Shop in South Amboy, New Jersey. 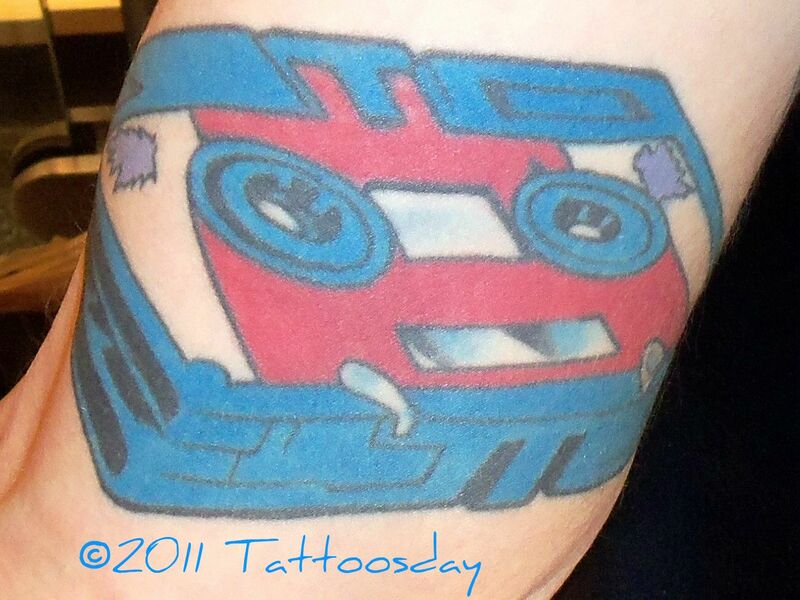 Thanks to Mark for sharing this cool tattoo with us here on Tattoosday! First, someone has been sharing links in the comments section anonymously on several recent posts. As is my custom, I only approve comments if they are related to the post in question. Nonetheless, the links point to a YouTube channel for Sullen TV. I thought I'd share one here, which features the artist Nikko Hurtado, and interested parties can explore their YouTube channel here. The other day I came across a cool site called FreshTrends.com that has a really nice collection of body jewelry, a lot of which would look great with a new tattoo. It's definitely worth a look! Last June, I featured this tattoo by artist Scott Campbell. I was recently told about this short film on the site Nowness.Be sure to check it out! Visit the Man Eater Facebook page for a taste of Erica Rivera's writing. Incidentally, that's a spider on the back of his neck, between the two royal tattoos. At the end of November, my wife Melanie received an e-mail from someone she met through her job. She often encounters people with tattoos and, if the work is interesting, and the subject arises, she will act as an ambassador to Tattoosday. 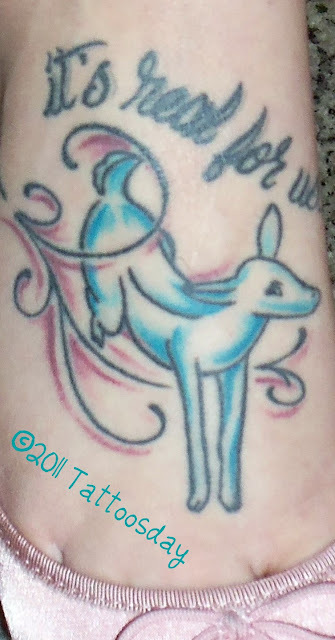 Toni is one such person who checked out the site, took pictures of her tattoo, and sent them to Melanie. She showed me the photos and promptly forwarded me the e-mail, which then sat for a spell in my in box before I inadvertently filed it away until I recalled it two months later. My mother passed away six years ago on 11/17/2004. For a long time I wanted to get a tattoo in memory of her without doing the RIP MOM thing I’ve seen so many times before. I think it’s nice, but it is not my style. A little over two years ago my sister and I were going out with some friends for dinner and my sister was wearing this very Victorian-style blouse. Pinned to the front collar of the blouse was a cameo that has been in my family for many years. It was passed down from my Grandmother to my mother and now to my sister. As soon as I glanced at it, it hit me! I will get a tattoo of this Cameo and then realized it would not only be for my mom. My mother, my sister, and I are obsessed with the Victorian era! We love everything Victorian. My grandmother loved the Victorian times as well. So I decided to bring the cameo with me to Twin Moon Tattoo shop [in Floral Park, Long Island] and had the artist Cindy sketch the cameo ... I love this tattoo so much, not only because it represents an era that I love but it also represents the three most important women in my life: my Grandmother, my Mother, & my sister! [Cindy] thought it was a little strange that I wanted it just below the inside wrist of my right arm and suggested I put it on the back of my neck or make it really big and put it in the middle of my back. I had explained the meaning behind the tattoo and how important it was for me that I see it everyday....That being said, she agreed and sketched it the actual size of the cameo and tattooed it on the inside of my arm right below the wrist. Thanks to Toni for sending along the photo and the story behind it to Melanie, and for consenting to share her lovely cameo tattoo with us here on Tattoosday! I met Cat earlier this week at Borders, which has been the go-to locale for inkspotting during a very sparse winter. The tattoos are variations on Celtic pagan designs that he modified to make his own. The right hand represents the chalice of the goddess, who represents expressiveness and creativity. Wiccan principles acknowledge that the goddess is the source of all expression. 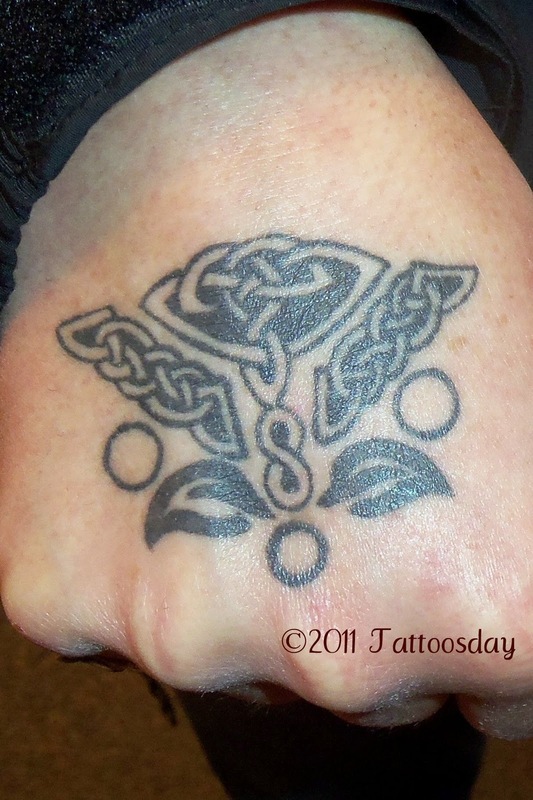 Cat's other hand is decorated with a Celtic triquetra. The three markings around the design are letters drawn in the Theban script, each corresponding to the first initials of his three children. Cat says that these, as well as his other tattoos, were inked by Neo at Village Moon Tattoos in Jackson Heights, in the borough of Queens. Readers interested in these tattoos may also be interested in checking out our old friend Livia Indica's site NeoPagan Ink. Thanks kindly to Cat for sharing his tattoos with us here on Tattoosday! I met Frank in the Penn Plaza Borders yesterday and stopped to ask him about his tattoos. This is a Transformer. More specifically, "Laserbeak," a Transformer that does reconnaissance. 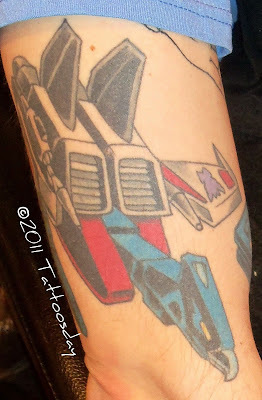 This is one of the first tattoos that Frank got and, as one would expect, he had this done because he likes Transformers. He credited the tattoo to Cort Bengston at Cort's Royal Ink Tattoo Studio in Patchogue, New York. Thanks to Frank for sharing these cool tattoos with us here on Tattoosday! Today's tattoo comes to us courtesy of Sal, who is making his third appearance on Tattoosday. We first met him in 2008 when he shared this Guns N Roses tattoo, and then again, in 2009 with this quote, inked on his forearm. The bird is an American Robin. Why this particular bird? 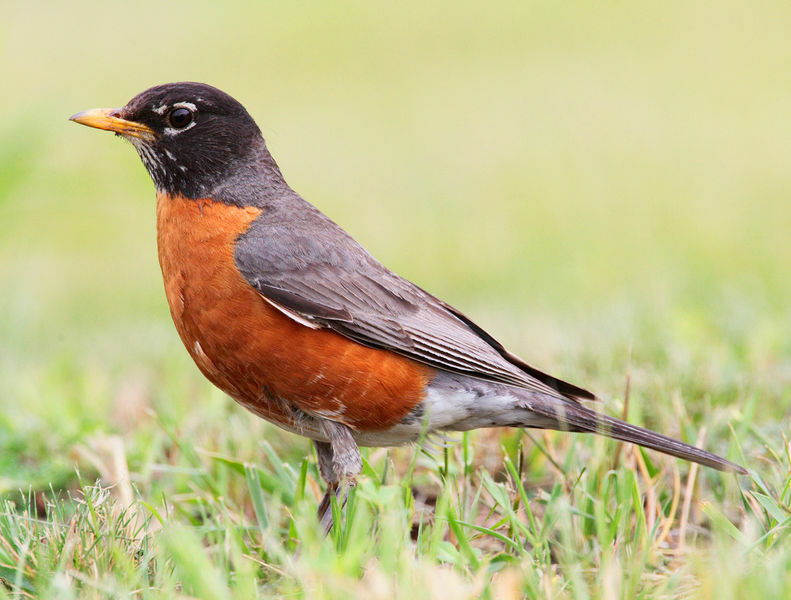 Sal explains: "Robins mean a lot to me - not just for their beauty, but for their meaning of hope and new beginnings". The tattoo artist is the phenomenal Mark Harada at East Side Ink in Manhattan. 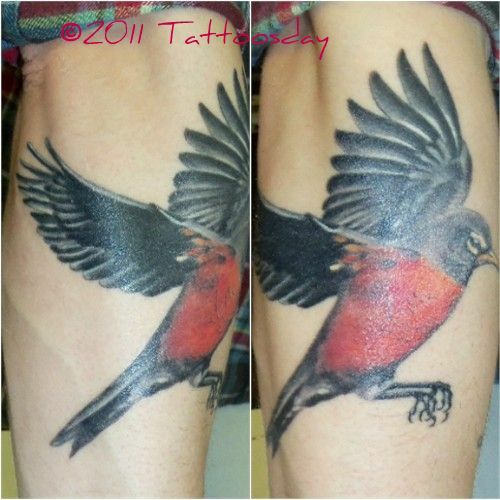 Work from Mark and other East Side Ink artists has appeared previously on our site here. Thanks again to Sal for sharing his awesome new tattoo with us here on Tattoosday! Bonafide Bags Winners and Special Discount for Tattoosday Readers! Congratulations to the following readers who were among the winners selected among the 51 commenters on the original Bonafide Bags post. I will be emailing winners by Monday. 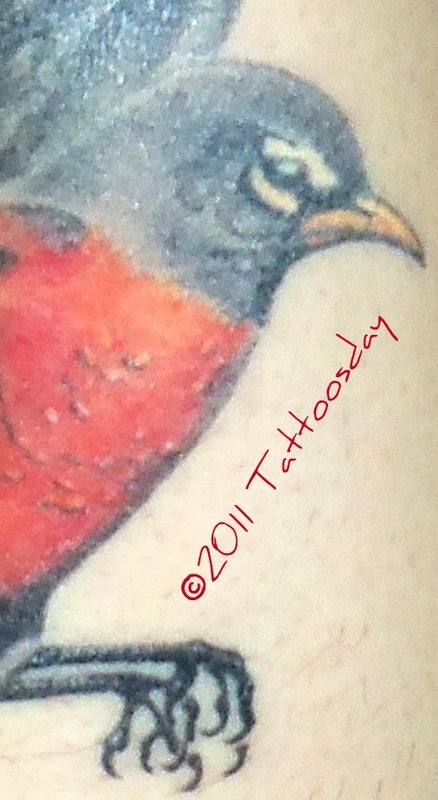 If you are a winner and don't hear from me, please follow up with me at tattoosday@gmail.com. We also thought we would like to reward your readers for participating and give them some incentive as well to get some bags whether they win or not. We created a discount code specifically for the readers of Tattoosday to receive an additional 10% off any order of at least $20. They can get the savings by entering the following code in the voucher section of the checkout page, the code is "tattoosday". This code is good through March...if we want to create new designs and keep pumping them out from lots of different artists, we have to sell these to make that happen. Please take advantage of this great offer and head over to Bonafide Bags and get some! Thanks to all of our readers who made this giveaway so much fun for all! And thanks to the good folks at Bonafide Bags. A couple weeks ago, I ran into Vinny at a Duane Reade on 86th Street in Brooklyn. Thanks to Vinny for sharing his ink with us here on Tattoosday! Now, if you've not read the Harry Potter series, perhaps it is best to skip the rest of the post, because it might not make a lot of sense. Those in the know will understand what I mean when I explain that the ghostly creature on the top of Ashley's foot is the patronus of Severus Snape, as described in Harry Potter and the Deathly Hallows, the final installment of the seven-part series by J.K. Rowling. 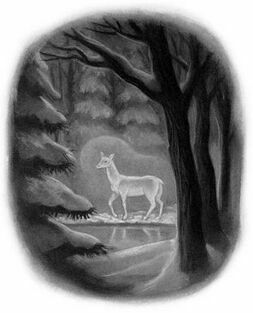 The patronus takes the shape of a doe. The quote above the doe is "It's real for us..." as remembered by Snape when speaking with Lily Evans, the girl at Hogwarts who became Harry's mother. Identical creatures appear when they cast the patronus charm. Ashley's friend drew it up and she had the piece done at Tattoo Nation in Wayne, New Jersey by Matt "Monty" Montleon. 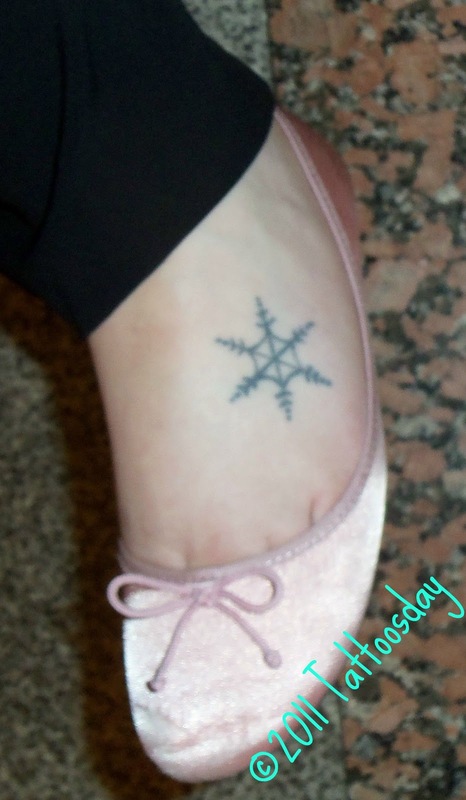 The snowflake was also inked by Monty and is a memorial to Ashley's grandmother, whose last name was Snow. Thanks to Ashley for sharing her two tattoos with us here on Tattoosday! This stunning work was created by the incomparable Virginia Elwood at New York Adorned. I have been fortunate to encounter Ms. Elwood's work previously here and here. 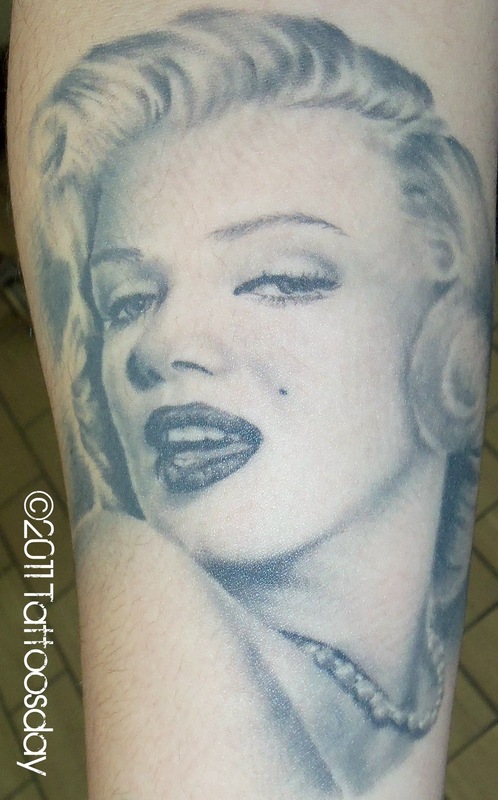 Melanie is a huge fan of Marilyn Monroe and she is proud to wear this icon on her sleeve. Clicking on the tag for Marilyn Monrow below will reveal other Marilyn tattoos that have appeared previously on Tattoosday. Thanks to Melanie for sharing this phenomenal portrait with us here on Tattoosday! Last month I enviously watched as the good folks over at TattooSnob had a contest in which they gave away some really cool items from Bonafide Bags. I reached out to the good people at Bonafide and asked if they'd like to do something with our readers, and they were very receptive to the idea. They're very sturdy and look really cool - perfect for a trip to the supermarket or the beach. They're made from recycled plastic and my lovely bride is already rocking her Japanese Koi bag. There are two sizes of each design. Check out Bonafide's website here for more product specifics, including close-up views, as well. How do you win a set? Leave a comment on the post below and winners will be randomly selected and receive a matching set of these Bonafide Bags. That's one large all purpose bag and its matching lunch/gift bag counterpart, or a $15.00 value. I have three sets of each of the four designs, so that's twelve winners in all. Now, let's see if we can outdo the readers at TattooSnob. They garnered 63 comments/entries in their giveaway, so our goal is 70 reader comments by Saturday, February 19, at 11:59 PM, EST. Tell us which one is your favorite design, or any other related comment, and you'll be eligible to win! Note: I have a filter on comments so if you don't see it right away, it's because I need to approve each submission to make sure it's not spam. Normally I would have prefaced this as a "Tattoos I Know" post, since the contributor, Jenise, has been a friend of mine since 1984. 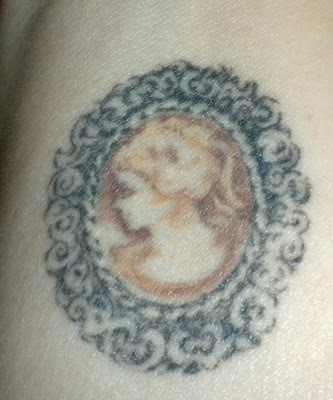 However, since we haven't actually seen each other in person in over twenty-five years, I've never actually met her tattooed self in the flesh. Jenise credits Clay at Willie's Tropical Tattoo in Daytona Beach, who inked these in February 2008. The piece was "designed to reflect [her] Hawaiian bracelet and it took [the artist] 2 hours to get it just the way he wanted it before he put the stencil on...". As for the words "Peanut" and "Shellfish," the tattoo also acts as a quasi medic alert bracelet, indicating two foods which make her seriously ill. So there's a practical aspect to the piece, as well. On a humorous note, she added "NO... these are NOT the nicknames of my children, I have been asked that more times than I can count". Thanks to Jenise for sharing her tattoo with us here on Tattoosday! A few weeks back, I popped in at my wife's workplace, and she introduced me to Miguel, the husband of one of her colleagues. In warmer weather, she had seen that Miguel had a tattoo, and she thought I would be interested in talking to him about it. Unfortunately, at the moment, it was in the high 20's outside and Miguel had on layers of clothing, which covered the artwork on his upper right arm. I did, however, ask him to send me a photo when he got the chance. Miguel told me that, one night, a couple of years ago, during a difficult time in his life, he had a dream about the tattoo and, when he awoke, he drew up the image he had seen in his mind. The vision, to him, "represents the evil that people have inside". He took the idea to Sunset Tattoo in Brooklyn, and one of the artists created the piece. Thanks to Miguel for sharing his tattoo with us here on Tattoosday! January was a bleak month here in New York City. The second snowiest month ever did not bode well for inkspotting, but on the last day of the month, I met Jenny, a graphic designer, at my local bookstore. She told me that the tattoo's orientation on her arm is, if you'll pardon the pun, key. It points toward her heart and represents the fact that she makes her own decisions in her life, or in her own words, "I open my own doors". She had this done by Mumia at Omega Tattoos in Queens. She added that all her tattoos are in black and gray, saying it is a matter of personal preference and that colors don't translate well on her skin. Check out Jenny's website here to see some of her design work. I especially like this example of her design for a tattoo shop. 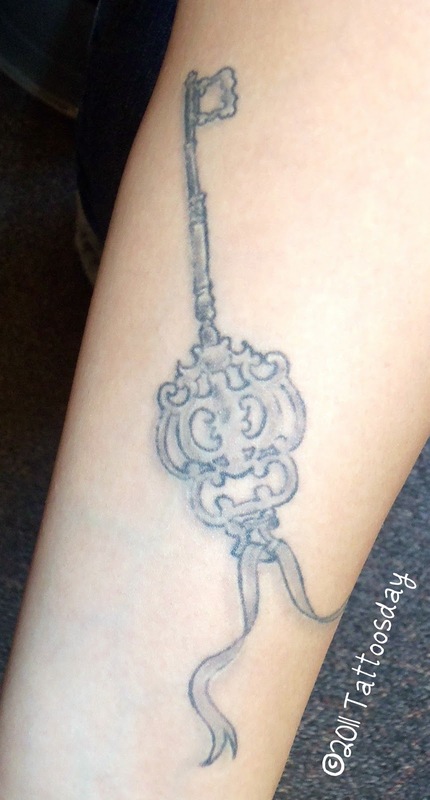 Thanks to Jenny for sharing this special key with us here on Tattoosday! 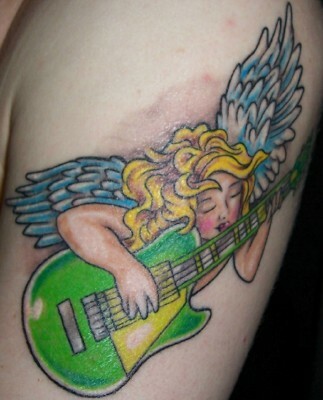 Greg credited Eddie and Ray, at Lucky Hearts Tattoo in Jersey City, New Jersey, as the artists responsible for his work. Thanks to Greg for sharing his tattoos with us here on Tattoosday! It's February 1, which means we are only two months away from the start of a new edition of The Tattooed Poets Project, and I have begun assembling the first posts for this annual extravaganza. What better way to acknowledge this looming event, but to post a poetic tattoo? What I noticed first was not that this was a line of verse, but that it was placed on the body in an unusual way. Most lines of poetry, when manifested on flesh, are on the arms and wrist, or the lower legs and occasionally a back. 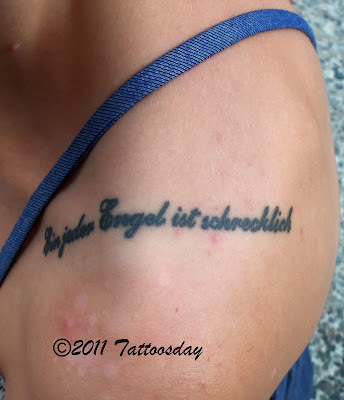 This tattoo runs from the front of to her back, vertically climbing and descending from her shoulder. The line is in German, and represents a piece from Rainier Maria Rilke's Duino Elegies. Those are the opening lines of the first elegy, translated by Stephen Mitchell. Rosa didn't give me much insight as to why she had the line tattooed, but it is quite a powerful statement. When I asked her who the artists was, she replied only that it was someone in Brooklyn that went under the name "The Milk Maid". This sounded familiar at the time, but I couldn't quite put my finger on it. Of course, I came to be reminded that The Milk Maid is the moniker of Joy Rumore, at Twelve 28 Tattoo, quite a wonderful artist, whose work has appeared previously on Tattoosday here. Thanks to Rosa for sharing this lovely line of verse with us here on Tattoosday!